Notes: This was a theatrical short originally shown after the Super S movie in Japan. It was later released on video and laserdisc as a standalone, and even later on R2 DVD with the Super S TV specials. 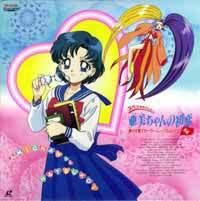 This story is based on a filler chapter of the Sailor Moon manga from Takeuchi Naoko. The Editor-in-Chief has chosen to omit the confusing SuperS typology in discussion of this season of Sailor Moon. 15 year-old Mizuno Ami is studying hard to get into high school, but when she finds a love letter in her locker, she starts to freak out. And later, when she finds out that someone named Mercurius is doing just as good as her in school, she starts freaking out even more, and starts rapidly increasing her study habits, much to the disgust of her friends. But when Ami starts to feel woozy soon afterward, and a mysterious woman comes and threatens to take away everything she studied so hard for, will Ami be able to transform into the Sailor Senshi of knowledge, Sailor Mercury, and defeat her? This was my first dive into the Japanese world of Sailor Moon (prior to that I only watched the English dub), and I'm very thankful for it. Anyway, notsalgia aside, Ami's First Love is a cute little story that, although not expanding upon the plot of the Super S season, is a must-see for Ami fans. It shows us a side of her we rarely see in the anime: competitve, aggressive, wearing glasses (something that occured much more often in the manga, but was seemingly lost in the anime), and fighting solo. That's right: Usagi and Chibi-Usa, for a change, don't save the day, and neither do Sailor Mars, Jupiter, Venus, Tuxedo Mask, or the Outer Senshi. That doesn't mean that Usagi and the others don't do anything, though. The scene where Usagi tries to shake down Umino for advice regarding the identity of Mercurius is very funny, as are the disgusted looks of Usagi and the others when Ami tells them that the guy she'd want to fall in love with should look like Einstein (um ... yeah. Ami sure has some weird tastes in appearance, ne?). Animation and art are very good, like all theatrical Sailor Moon is. The music is very fitting and pretty, even featuring a new opening theme (with no words) excusively for the short. And of course, the seiyuu each fit their characters to a tee: even the new monster of the day sounds good. Since it's a short, Ami's First Love doesn't have too much of a story to work with, but it gets the job done, and should be seen by all Sailor Moon fans (especially fans of Ami). Also, unlike the movie that came after it, it feels like a true, bonafide Sailor Moon work. Even though Usagi herself is barely in it at all. Recommended Audience: Aside from a *little* flesh from Minako (and it's just part of her elbow, mind you), there's nothing at all objectionable about this at all. Fun for everyone.